It's pretty clear that I'm not exactly a sweets guy - that includes little treats to full-on desserts. I mean, I don't mind the occasional macaron or lemon tart. It's just that I much prefer snacking or nibbling on savoury bites. Give me an appie platter and a cold beer and I'm happy. 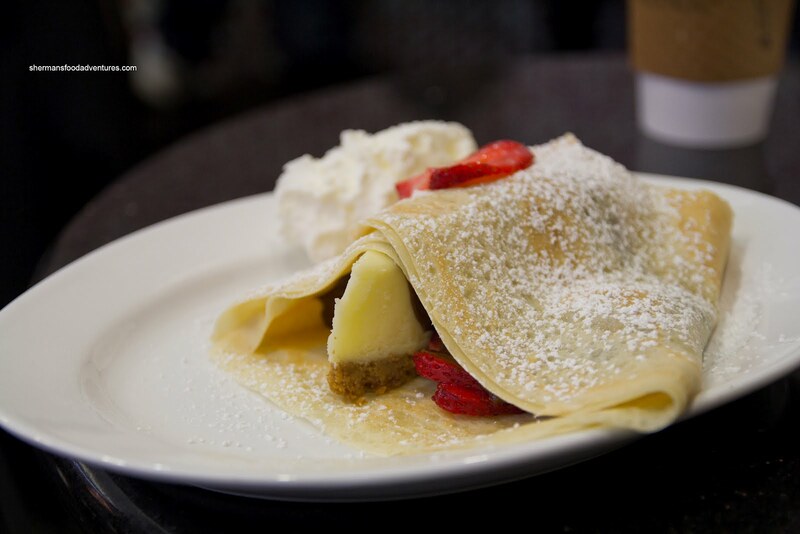 So imagine my apprehension when Crepe Delicious contacted me about trying out some of their offerings. I asked myself: "self, would this even be a worthwhile experience?". I took a look at the menu and there were some savoury choices as well... Oh fine, why not, I'll give it shot. Now, unlike some people (Mijune), I cannot eat 4 desserts, let alone one all by myself. So I brought the whole family, including the kiddies. My daughter (who is aspiring to be mini-Mijune) had the Tuttie Frutti without the Nutella. The crepes were freshly made right in front of our faces. Therefore, they were naturally fresh and warm. I wouldn't classify the crepes as the super thin variety, but they were not rubbery. I also wouldn't say they were fluffy either. The best way to describe them would be somewhere in between (still very easy to eat). The fruit was fresh and if we hadn't excluded the Nutella, there would've been some extra sweetness to balance off the tartness of the strawberries. We also had a savoury crepe being the Mediterranean consisting of tomato, lettuce, peppers, red onion, black olives, mozzarella, feta & Greek dressing. 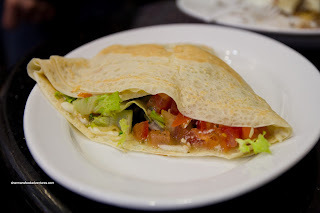 If you can imagine, it was like eating a Greek salad of sorts (without the cucumber) within a crepe. 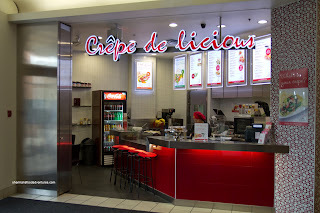 Okay I guess, but I much prefer dessert crepes (if I actually had a preference for desserts that is...). 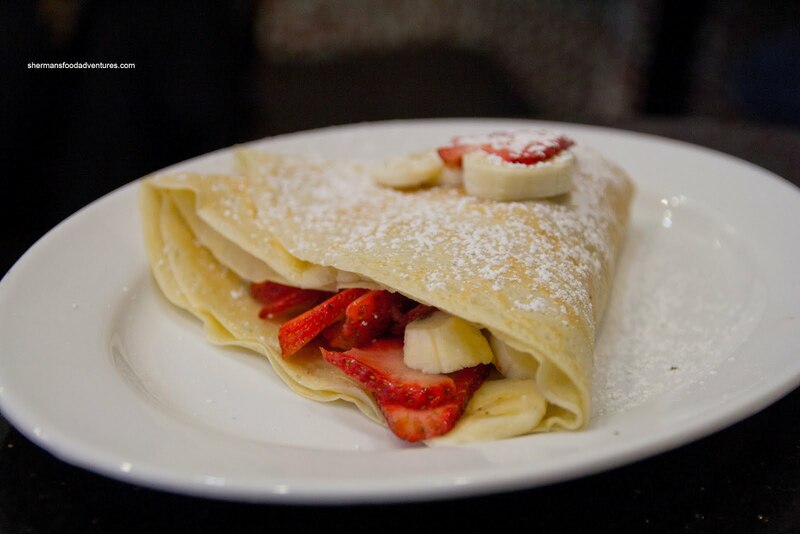 Lastly, I had the mother-of-all-crepes in the New York. It was literally a slice of cheesecake with Nutella and strawberries in a crepe topped by dulce de leche. To say this was sinfully sweet would be an understatement. The cheesecake was pretty standard being NY-style (naturally). It was a bit difficult to eat in terms of getting everything in one bite though. In the end, we were pretty satisfied with the items that we tried. Their crepes were consistent and nothing was out-of-the-ordinary (pretty standardized because it is a chain).